Milieu features a boy who has falles into a well. French puppeteer Renaud Herbin climbs at the mouth of the well and calls him back to life. 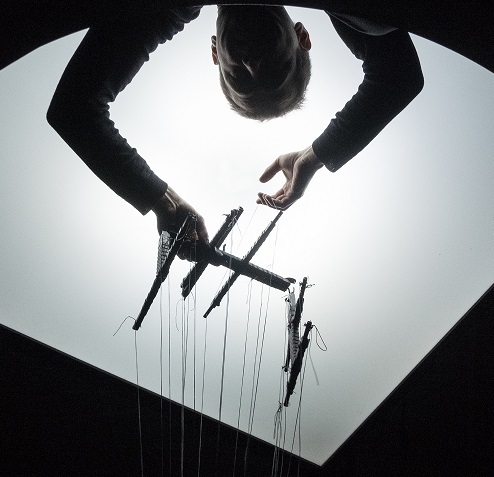 A fantastic play with strings commenses as the boy is a marionette. 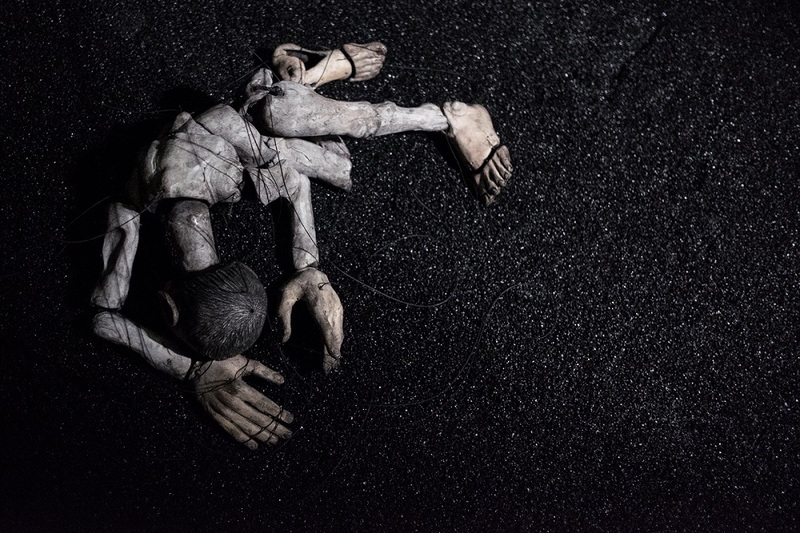 The nameless boy is made of many smaller pieces, almost every piece connected to a string. His feet and hands are seem bigger than the body but it does not faze him. The boy wakes, sits up and looks around - emptiness all over. Slowly he gets up, each pull of a string making him stood up straighter. The body is an exact replica of a human's body, thus it feels very physical to look at his movements. The boy starts to search the walls but there seems to be no exit. Jumping up is also without results, it tires his body and soul. It would be wiser to get used to the new environment, with the milieu. When he lays down the floor starts to breathe under him. The boy also eminates hard sighs as he seems not to be content with his situation. What comes next requires even more use of your fantasy because the spectator must follow his thought and actions. The breathing of the floor turns into a beat, into music and the boy starts dancing to it. I have never seen a marionette dancing to techno music! If one could say like this... The boy feels it. A remarkable sight! Herbin showcases excellent technique as the puppet truly lives, feels the music and let's it carry him. The techno beat and the dancing puppet are the highlights of the short performance. I see that the music and movement are the mirror of the boy's inner self that shines through the tough situation he is in. The passionate dance moment is over and water seeps into the well. It vibrates with the soft rhythym of the bass, making small waves. The water flows in until the boy's feet can not be seen. There is a hole in the middle and the boy plays in it. He puts his head uner the water several times and lastly, helds his breath for a long time. He splashes out, tired and wet, pulls into himself and stills. Milieu shows how important it is to connect with what it around you. Find something that inspires you to move, talk, or write. It also displays the strenght of thought that is given to us. A single marionette boy searches his surroundings and enjoys what his imagination gives him. To the viewer Herbin's creation is a real treat of professionalism.